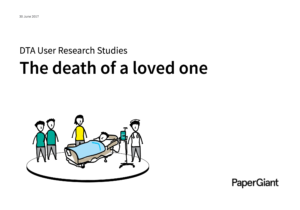 This research shines a light on the experiences of those who have had a loved one die. Paper Giant was engaged by the Digital Transformation Agency to explore the experience of dealing with the death of a loved one and available services during the period leading up to, immediately after, and in the months beyond a loved one’s death. Over eight weeks we conducted 33 interviews with 39 people who had lost a loved one between 6 and 18 months ago. We also interviewed 9 service providers—from lawyers and financial planners, through to funeral directors and mental health professionals—about their own experiences in helping others through their experience of death. This journey is a representation of some of the diverse and touching stories we heard in our research. It depicts the circumstances, supports, services and policies that factor into the experience of death. It describes the journey of death from the perspective of those left behind. This report documents the findings of our research. The report begins by setting the broader context of death in Australia. Following this, the we detail findings and outcomes from 33 interviews with 39 people who had lost a loved one between 6 and 18 months ago, and 9 service providers who work in death related industries. What makes a death ‘good’ or ‘bad’? What’s it like to lose a loved one? How does death a ect the lives of carers? Socially and culturally diverse perspectives. What’s it like to be a death service provider? We identified key opportunity areas based on unmet or poorly met needs, that provide direction for future services. How might we help people better discuss, prepare, document and share for death? How might we help carers access benefits, respite and carers formal and informal supports? How might we help medical professionals communicate more effectively with each other and with carers? How might we help medical professionals perform their duties with greater sensitivity to carers?